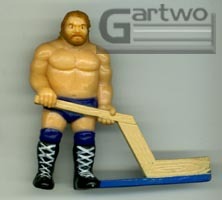 These figures were a part of a big WWF Tabletop Hockey game released in 1990 by Remco. I had no idea how big the thing was until I bought it through eBay. I really didn't have an interest in having the game itself, I just wanted the figures. 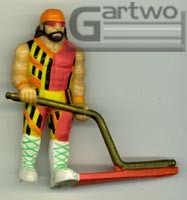 But after I got it we've actually had a lot of fun playing it. 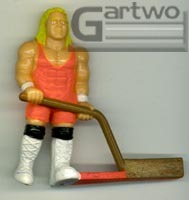 These are some of the most unique wrestling figures you'll ever see. 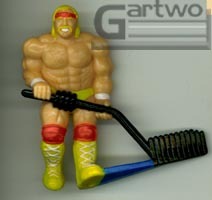 Each has figure has his own hockey stick customised to his character, (Hulk has barbells, Duggan's 2X4, Jake's snake) . 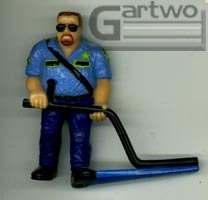 There are 12 figures--6 good guys and 6 bad guys. 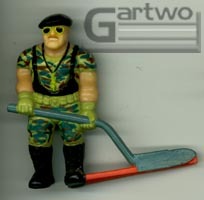 The big dudes, Earthquake & Tugboat are naturally the goalies. 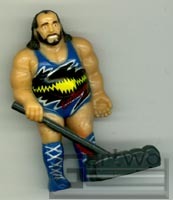 UPDATED: Originally I thought the figures with logos painted on their sticks were a factory variation. However, after getting my hands on a couple of these examples I discovered that the logos are actually stickers, and not painted on like I had originally assumed. Therefore, i'm now fairly certain that the logo stickers came packaged with the game, along with the rest of the stickers that go on the game board, and it was up to the owner to put the stickers on the figures or not, instead of them being put on the figures during production. That would explain why some have them and some don't & why none of the figures seen MOC have them. So that solves that mystery. 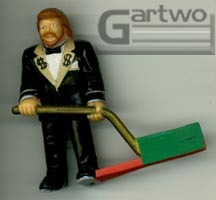 So far it's been confirmed that there were logo stickers for Earthquake, Ted Dibiase (which are pictured to the left), Mr. 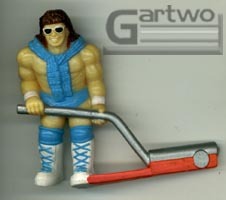 Perfect, & Rick Martel. 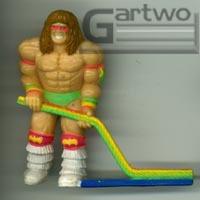 If anyone has this hockey game MIB with all the stickers intact, and can confirm exactly which figures had stickers, please pass along the info to me. 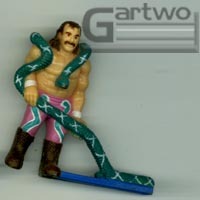 All of this sticker nonsense still doesn't change the fact that there is a variation on the Jake Roberts figure. As you can see in the pic to the left, Jake's snake has a white belly, as opposed to the more common (at least by my observations) green belly.